Nestling cozily on its sandwich tray, this soup bowl helps you indulge your comfort food cravings. 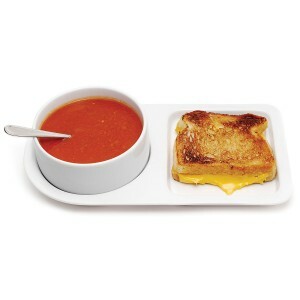 Perfectly sized to serve up tomato soup and a grilled cheese sandwich, this ceramic combo lets you end the precarious balancing act of enjoying your favorite quick and comfy meal. Safe for use in the oven, microwave and dishwasher, the simple white serving pieces are always ready for those relaxed rainy day meals.